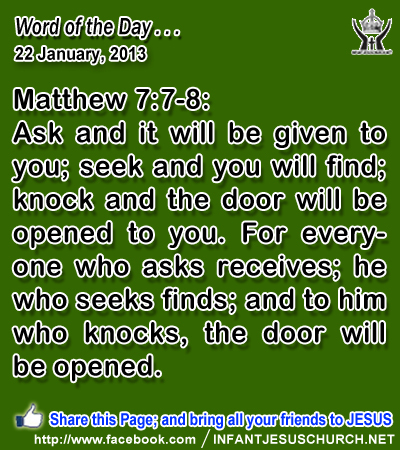 Matthew 7:7-8: Ask and it will be given to you; seek and you will find; knock and the door will be opened to you. For everyone who asks receives; he who seeks finds; and to him who knocks, the door will be opened. Heavenly Father, we are sorry that so often you only hear our whines and complaints and concerns. You have been so kind with your love. Help us to keep our heart set on you and your will today as we ask you to minister to the things on our heart. Through Infant Jesus we pray. Amen. When David and his men were fleeing for their lives, they required food from Ahimelech the priest. The only bread he had was the holy bread presented in the Temple. None but the priests were permitted to eat it. In their hunger, David and his men ate of this bread. Jesus reminds the Pharisees that the Sabbath was given for our advantage, to refresh and renew us in living for God. It was planned for good and not for evil. Withholding mercy and kindness in response to human need was not part of God’s intention that we rest from needless labor. Do we honor the Lord in the way you treat your neighbor and celebrate the Lord’s Day? Loving Infant Jesus, may we give you fitting honor in the way we live our life and in the way we treat our neighbor. May we honor the Lord's Day as a day holy to you. And may we always treat others with the same mercy and kindness which you have shown to us. Free us from a critical and intolerant spirit that we may always seek the good of our neighbor.